Yesterday, I posted the latest yield that you can get if you purchase the Singapore Savings Bonds. And a few readers main comment is that the yield curve is inverting and we should be careful. As you can see from the 1 year and 10 year SGS bond yield, the yields look to be narrowing. And if the yield inverts, it is a really bad thing. I think there is validity about respecting the yield curve, but as an indicator, it might not be the most reliable. The yield curve shows the prevailing interest yield for different duration of the countries government debts. For debts a longer tenure debt has more risk, because they are subjected to interest rate fluctuations, credit events, inflation, economic factors. Thus, when risks are higher, the interest rate investors demand should be higher. So in norm situations, the shorter tenure bonds (1 year) should have an interest yield that is lower than a longer tenure bond (2 year), so on and so forth. This tenure vs return relationship usually are in balance, but there are situations where the relationship is disturbed. Certain unique demand and supply of these government bonds, would cause them to go wack. The shorter term rates usually take their cues from the central bank. The central bank controls the short term borrowing rates to the banks. Changes to these rates, usually cause a similar directional change to the short term rates. And since the tenure vs return relationship is still valid, all the different maturity bond yields should go up. The yield curve inverts for a few reasons. The main one is that, in a normal economic cycle, the central bank wishes to rein in inflation when the economy is good. So they raise rates, make borrowing more costly, and slow down expansion. The corporate bonds are usually priced at a spread above the government bond rates. While the short term rates will go up, the demand and supply for the long term rates may be affected by other factors. When the market got to a stage where there are not much to invest in, nothing attractive to purchase, 10 year government bonds becomes attractive and thus the demand for it goes up. When there are greater demand, the prevailing interest yield need not be high to attract the investors (they would like to deploy to safety more than a super attractive rate of return). This prevents the yield from going up. Overtime, the yield curve inverts. Does the Inverted Yield Curve Precedes a Stock Market Bear? Every Recession was Lead by an Inverted Yield Curve. The data point that caught many of our attention is that in the past 60 years, every US recession was preceded by an inverted yield curve. And that is enough to sound the alarm. Recession, is a part of the cycle, that happens in main street, or every day life. What you wish to find out is whether an indicator like the inverted yield curve lets you know a bear market earlier. And that might not be the case. There is another thing that precedes a recession normally, and that is the stock market. So the question is whether the inverted yield curve precedes a bear market? 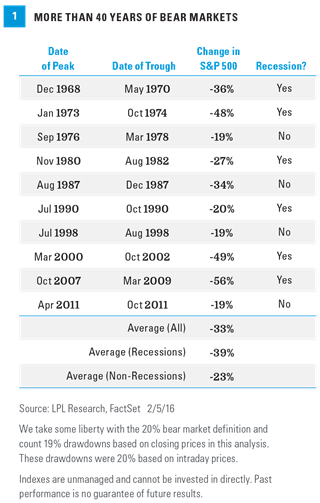 The folks at Pension Partners tabulate the following in 2014, trying to see if there is a relationship between an inverted yield curve predicting a bear market. And it turns out that there are some months where the market peaked before the yield curve inverts. And then there are some where the yield curve inverts and nearly 2 years later the market peaks. That is probably the one that I experienced, which is in 2006. We will talked about it later. In some other research, they brought about less sample, and you realize they brought up some inversion that Pension Partners did not bring up. The difference could be what was used, whether it is 10 year minus 1 year or 10 year minus 2 year. As you can see, there are more instances where the peak happen 2 years after inversion. One other thing you would realize is that, the sample size is very small. When the sample size is small the result have a tendency to swing to both extremes. And if you are interested, not every draw down happens because there is a recession. There were some draw downs that are rather nasty, and there weren’t any recessions. What is the Value of an Inverted Yield Curve…. When we are already drawing down? If we say that the curve is about to invert now, and the market is already in a draw down mode, then what do you want the inverted yield curve to tell you at this point? If this eventually ends up as a 30% draw down, in quantitative terms, it will be marked more into the group where the market peak but that happens before the yield curve inverts. As I said, I went through only one episode of inverted yield curve in my life. And back then the situation is like this as well. Just that it scared me more than this. And we have to wait for 2 years later before you see the actual danger. 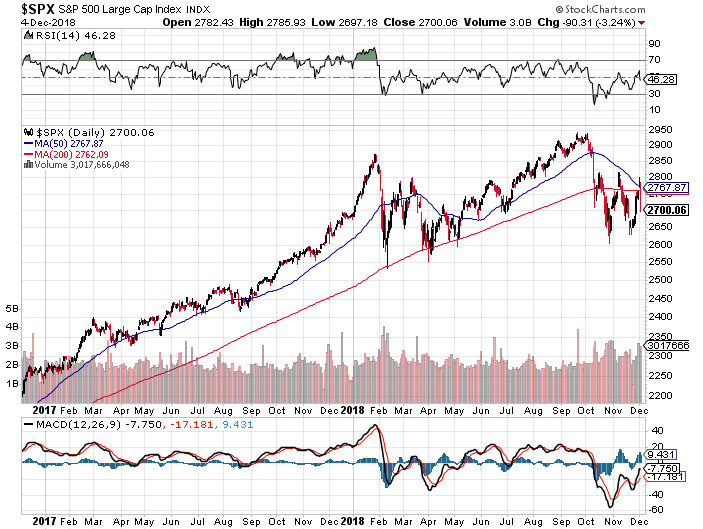 I think if you look at the above S&P 500 chart, I would be concerned based on the about the cross of the 50 day moving average, cutting the 200 day moving average from above. It is more sinister due to that the 200 moving average is flat. The moving average cross over tend to be rather lagging and you could use it as a means of controlling the level of your portfolio allocation. However, there tends to be whipsaw sometimes, and you end up going in and going out. So you got to be comfortable with that. There are some of these stuff that seams to make sense, but actually not so useful. I have this article where I consolidate a lot of them. Lastly, a draw down can be short like a few days, a few months, or 1 to 2 years. Unless its a 2008 situation, I think a lot of market dynamics shows that you can pick up some stocks at attractive prices. Don’t be those folks that every time only wait to invest during a bear market, if not they don’t know how to invest. After that 2 years of draw down, how are you going to deploy your capital you accumulate for the next 20 years? Keep waiting for a bear? DoLike MeonFacebook. Join myEmail List. I share some tidbits that is not on the blog post there often.